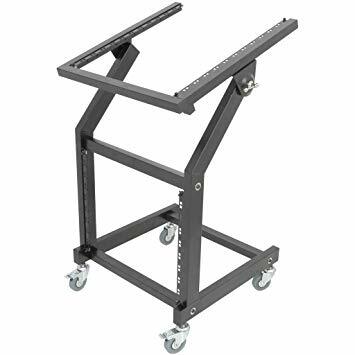 The Citronic Freestanding 19 inch Rack for Sound Equipment provides 12U of equipment space and can be tilted up to 20 degrees to provide a comfortable working angle. The lower vertical section provides 8U of rack space. Locking Front wheels. Flat packed for easy transportation and simple assembly. The Freestanding 19 inch Rack provides a great alternative for equipment that needs portability. Wheel it into position and tilt for that perfect angle! For any Questions about our Citronic Freestanding 19 inch Rack for Sound Equipment; or for Prices on delivery to the EU please contact us. Or; why not visit our Facebook page and follow us? You can see ALL the latest info as it happens!